No Prior Plastic - ZineWiki - the history and culture of zines, independent media and the small press. 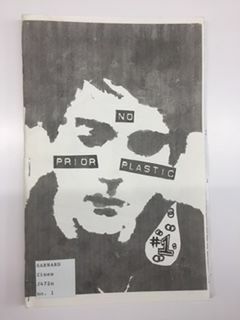 No Prior Plastic is a zine created by Jessica G.
Published in 2004 in North Creek, NY, U.S.A., in her first issue Jessica G cuts and pastes a collection of her high school journal entries, a letter lambasting President Bush, an essay on feminism, and a list about falling in love. She also includes zine reviews, a soundtrack listing, recipes and a No Prior Plastic magnet. This page was last modified on 3 July 2018, at 08:10.